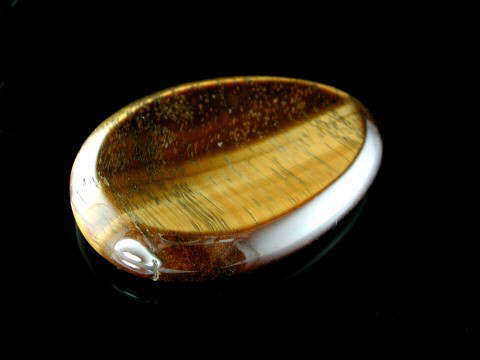 Gorgeous Tiger Eye small palmstone, or thumb/worry stone. These smaller palmstones are often referred to as thumb or worry stones because they have a small, smooth indentation on one side, which when held in your hand is the perfect shape to rub your thumb over. This process can be used whilst meditating to help connect with the crystal's deva or to relieve stress, hence the name 'worry' stone. Tiger Eye is a chatoyant version of Chalcedony, therefore it is also a member of the Quartz family. (Chatoyant means when a stone exhibits a silky, somewhat lustrous look when light hits it from different angles and comes from the French, 'chat oeil' meaning 'cat's eye'). This reflective quality gives it a protective quality and it also considered a stone of good fortune, especially in consideration of financial luck. It has been used successfully to give power boosts to the Solar Plexus Chakra, consequently, is good metaphysically where a weak-will or low self-esteem are indicated; physically for gastric disorders and mentally as a courage booster. Perfect size to carry around in your pocket!